India being an advanced country and working to lead all the citizens to new technology. They ensure the citizens get food in subsidy by providing a card known as the ration card. This a very significant card to all families living in the Indian country. However the country is divided in many state which follow suit in providing good prices for all the commodities. 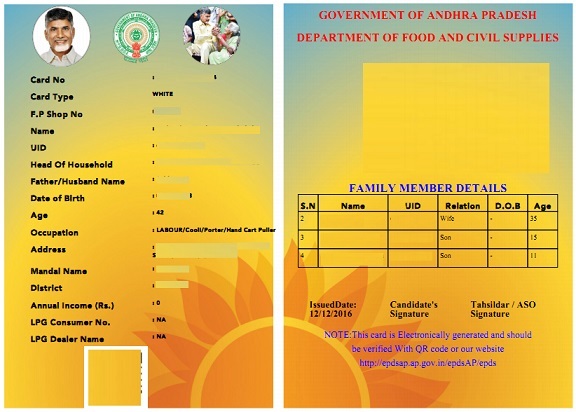 The card is used by the food department under the state government. The ration card assist in getting grain foods and fuel. This card is divided in three and have different colors as White color, Yellow color and Pink color. This cards stands for various reasons and different people. Not all cards have subsidy but here we can learn the uses. This card issued for above poverty line it is used to families with an earning of Rs.1 lakh yearly. The families don’t get any subsidy from the government. They mostly use the card as an identity and as proof in getting other document. Remember it is mandatory for the all families to have a ration card. This card is very sensitive as it serves citizens who are very poor. This families don’t have stable income some are very old others are orphans. Basically the government gives them commodities at a very low price. This a card issued to citizens below poverty line they are not badly off but receive subsidy on some commodities. With this three cards the government can trace the citizen’s incomes and now whether the poverty lines are diminishing. Recently the government has reconsidered and came to a conclusion of abolishing the pink ration card. Yes the question remains why and what nest for the class of people with the pink ration card. Most citizens have given complaints of hardships and some feeling the economy pinch. With this the government felt they should issue the white ration card and also give subsidy on some commodities. In this article we will get to know the process both offline and online method of changing from pink ration card to white ration card. Visit the state food department website. This is according to the state you belong to. When the home page opens go to the ration card section. You will see the change card link note this will go according to the states. There is the pink ration card to white ration card section. Now fill in the details and upload the documents needed as proof. Here you have to give or upload a copy of your ration card. Recheck the details and submit the document plus the application form. You will receive an acknowledgement number which can be used to track the status of your application. The ration card will be mailed to the address provided. Fill in all the required document and details. After this submit the documents and also give a valid ration card. The officers in charge will give a day for the family to take photo. After this an acknowledgement receipt will be issued. This receipt can be used to check the status. However the card takes 3-4 weeks and it will be mailed to the address given in the details. School leaving certificate of the head of family. Give identity proof like the PAN card, DL and Aadhaar card. In most case the citizens want to change from the pink card as it doesn’t have any benefits besides identity proof. The white card gains you food grain fuel and rice at a cheap price. The card is better than the pink card which is consider to be for the rich. If the family income goes down or the head stops earning a big sum/salary the family suffers high prices. The family has to give enough proof in order to change from pink ration card to white. Nonetheless some families change from white to pink according to the income. This are very few cases but it still happens. Government advocating for this change which will suits all citizens. Giving food subsidy will ease and reduce cases of poverty and equalize everyone in the country. Ration card being a legal card shouldn’t be there to favor some. This why the central government and the state government is working hard to change from pink ration card to white ration card. What are the Benefits of owning a Ration Card? This card is considered as multi-purpose which works to produce other documents. Most institutions like bank need one to have an Aadhaar card which has to be linked to the bank account. Yes the ration card has great impact on this as you have to give the ration card to get Aadhaar card. This card helps families get food and fuel and also acts as an identity. This makes the government to be strict on matters of ration card. All families have get one and if shifting or a marriage. Change the name and get a new ration card or register with your husband’s card. Food and Commodity Subsidy: All the state governments give subsidy to all basic foods and commodities. This helps families live a normal life and get basic wants. This only happens to ration card holder and especially the white and yellow card owners. This bring up the issue of change from pink ration card to white ration card in order to receive the subsidy. Address Proof: Ration card is a legal document showing the address of the holder and members. You need it while buying goods at the state. Most banks use the ration card to issue loans and also in linking the Aadhaar card. What the difference of the white and pink card? This a frequent question as many would like to apply for new ration card. White card is given to families below the poverty line. They are not badly off but still get subsidized commodities. Pink ration card this a card issued to well off families they use the card for identity but no low prices are applied on the foods and commodities. The state government has also introduced yellow card for the poorest families in the country. What Documents are Required in Changing the Card from Pink Ration Card to White Ration Card? Applying for the card is not hard you only need to produce the old ration card and proof documents. The age and address proof. Then visit the food department offices or website for application. How long will it take to receive the new white card? After the application process the card will take 2-3 weeks and the card will be send via the mail. The applicant must give a valid address. What are other purposes for the ration card in general? Besides buying food at low prices the card is used for identity proof and helps get other important documents. What are the documents need for applying all Ration Card? Individuals applying for the ration card should produce proof documents. Address proof: telephone bill, electricity bill. Pass photos for the head of the family. Form-D Application.